Five people have now been confirmed dead in the Strasbourg shooting on 11 December. French media say the fifth victim died after five days in a deep coma following the attack, and 11 others remain wounded - four of whom are in hospital. The dead are known to include foreign nationals and news outlets both in France and abroad have identified several of those hurt and told their stories. 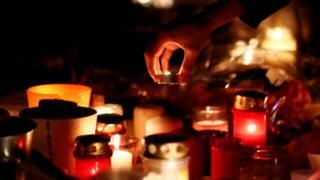 Le Monde reported the fifth victim on Sunday as Polish national Barto Pedro Orent-Niedzielski. Nicknamed "Bartek", the 35-year-old was hit in the head by a bullet and died after five days in a deep coma, the newspaper reported. The Polish man spoke several languages and had volunteered for many charitable causes in the city. He was reportedly with another victim at the time of the attack - Italian journalist Antonio Megalizzi. The 29-year-old was critically injured in the attack and his death was announced three days after the attack. Italian PM Giuseppe Conte said Mr Megalizzi had a "great passion for journalism, for radio, for investigations and for European institutions". Mr Megalizzi was in Strasbourg covering the plenary session of the European Parliament for Europhonica radio. A Thai tourist, identified by media in Thailand as 45-year-old Anupong Suebsamarn, was the first to be confirmed dead. Thai foreign officials confirmed that one of its citizens had died while on holiday. Thai media said he had only recently arrived in France, and had been killed by a gunshot wound to the head on rue des Moulins. Kamal Naghchband, an Afghan national, died of his wounds, his local mosque in Strasbourg announced. The mechanic and father of three was hit in the head and fell into a coma, the Grande Mosquée Eyyûb Sultan said on social media. He had been walking towards the city centre with his family. He succumbed to his injuries on Wednesday afternoon, the mosque said, and his funeral was held three days later. On Thursday, French authorities said a third person had died. Strasbourg mayor Roland Ries told French TV that a local resident, born in 1957, had died on rue des Chandelles. He provided no further detail, though French media reports said he was a recently retired former bank employee. Europhonica, the group employing Mr Megalizzi, said that a French staff member living in Strasbourg was also seriously injured, but did not provide any details. Artist's space La Maison Mimir told Dernières Nouvelles D'Alsace that a musician was shot in the neck while out performing and was now in a coma. A guitarist who was also performing was also hurt, but not as seriously. French newspaper L'Est Republicain said that 28-year-old Jérémy Raoult from Vosges had been in intensive care and put in a coma, though it is not clear if he is the same injured musician referred to be La Maison Mimir. Le Républicain Lorrain said that Lola, a 20-year-old student from Metz, had been shot in the back while fleeing. She collapsed and was tended to by a friend while she called her parents, the newspaper said. Her life is no longer in danger, it added. Jeanne, daughter of local cheesemonger Christelle Lorho, was shot in the arm but is now out of danger, Christelle said on Facebook.